Captain America: The Great Gold Steal (1968) | 'TAIN'T THE MEAT… IT'S THE HUMANITY! Steve Rogers – Captain America – was a man out of his own time. Some times the memories would come – as they had earlier this day when there were no diversions and no escapes left – but they were painful memories, and not at all the memories of normal men. Captain America was not, in any sense of the word, a normal man. 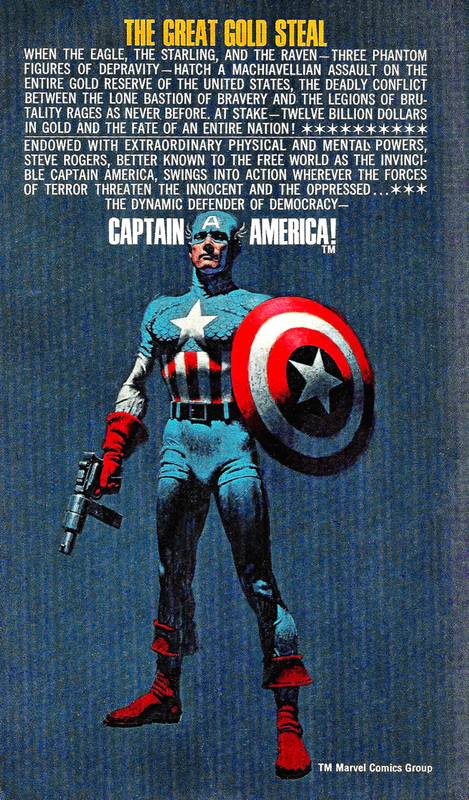 Captain America: The Great Gold Steal was published by Bantam Books in July 1968 and was the second attempt to translate a Marvel Comics property into a prose novel. Sadly it shared the fate of its predecessor and failed to find an audience, quickly vanishing without trace. Well, almost. Written by science-fiction author Ted White, and featuring an introduction by Marvel Editor Stan Lee, Captain America: The Great Gold Steal chronicles the superhero’s attempts to foil a $12billion gold bullion heist while dodging several attempts on his life. The book was published a year after the Otto Binder penned The Avengers Battle The Earth-Wrecker and it’s a far better read. Clearly a fan of Ian Fleming’s James Bond and Lester Dent’s Doc Savage (a minor villain, Monk Mayfair, is named after a character from the Dent series), White imbues the story with healthy dollops of intrigue and action, while keeping the story flowing at a crisp pace. Brisk story-telling aside what really makes the novel stand out is White’s re-imagining of Cap’s origin. He greatly expands on Jack Kirby and Joe Simon’s original premise from the character’s debut in March 1941, while adding some modern twists of his own. For instance, gone is the single dose of Super Serum that instantly changes 4F Army reject Steve Rogers into strapping powerhouse Captain America. Instead White has the transformation take several weeks as Roger’s is dosed with several drugs designed to rewrite his body chemistry, while simultaneously undergoing operations to strengthen his bones with steel. 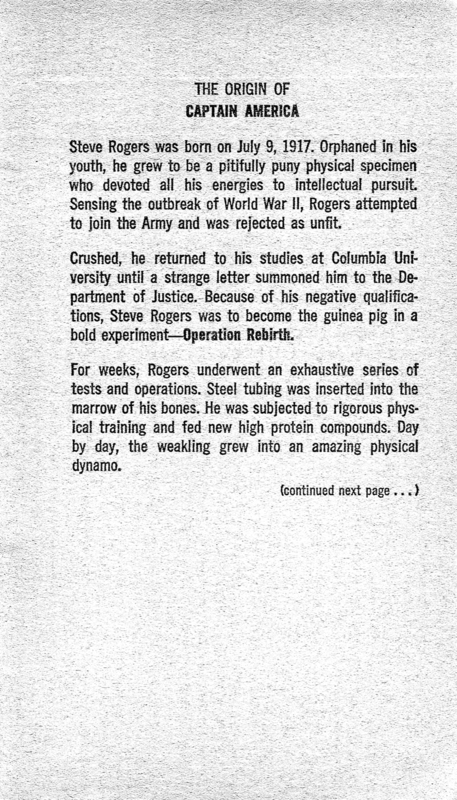 And in a bold move, one very much in keeping with the times, White also has Rogers dosed with a form of LSD that rewires his brain allowing him total control over every aspect of his body, from boosting his adrenalin during a confrontation to increasing anti-bodies to fight off infection. In both body and mind Rogers truly becomes a superior man. White also fills in a great deal of Rogers’ back story: his childhood; the death of his mother in child birth and his relationship with his older brother. His tenure as Captain America during World War II is also covered as is his revival by The Avengers after spending 20 years in suspended animation. Similar to Binder in The Avengers Battle The Earth-Wrecker, White also depicts Cap as a man out of his time, struggling to fit into a world drastically different than the one he left behind (the sequence where Cap first sees the New York of the mid-Sixties is memorable). White even finds time to suggest another use for Cap’s shield: the red and white stripes can be utilised to temporarily hypnotise an assailant. Probably the biggest difference between White’s interpretation of the character and the Marvel version is Captain America himself. White portrays him as a professional soldier, one matured and tempered by his experiences in battle – the idealistic blue-eyed boy scout from the comics is nowhere to be seen. However, as entertaining as the 118 page novel is there are a few problems. The ending is wrapped up far too quickly and is muddled by the revelation of the identity of the crime’s mastermind. White also devotes so much time to the novel’s various antagonists that Cap sometimes feels like a secondary character in his own story. These problems are easy to forgive though and don’t really hamper the story. 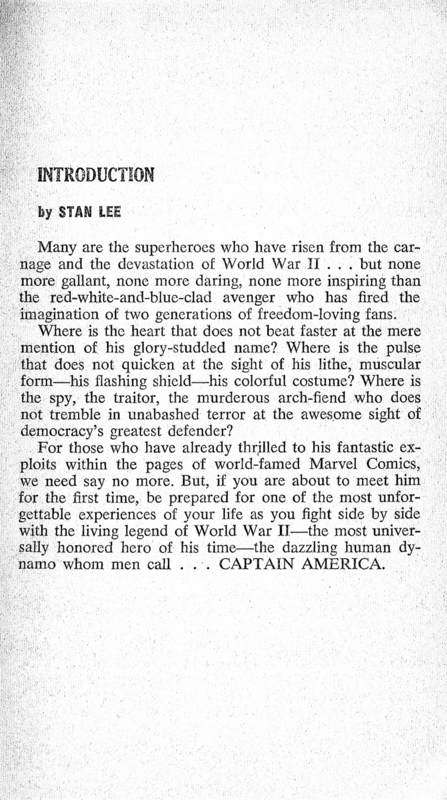 What are more annoying are the frequent references by Stan Lee to back issues of Marvel Comics that appear at the bottom of some pages – those ‘Reminiscent Stan’ references may work in the comics but they’re irritating when reading a novel. 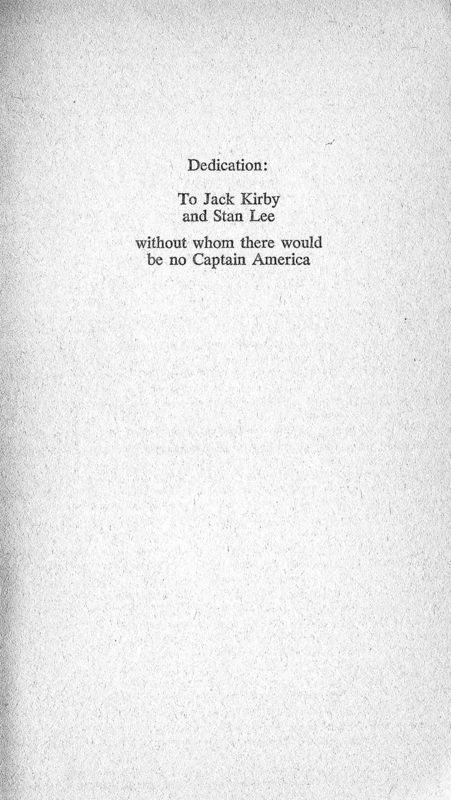 More controversial is the book’s dedication, which thanks Lee (who didn’t create the character) while ignoring Cap’s co-creator Simon. Although Captain America: The Great Gold Steal and The Avengers Battle The Earth-Wrecker were meant as the vanguard of a new wave of novels featuring Marvel superheroes, both books failed to strike a cord with audiences. White has subsequently claimed that the book did sell its initial 95,000 print run but it wasn’t reprinted and, like it’s predecessor, it quickly vanished. Well, almost vanished. Like Binder’s novel, Captain America: The Great Gold Steal is remembered today, but more for its cover artwork than anything else. The striking image of a brooding Cap brandishing both his shield and a gun is as eye-catching and effective as it is simple. Over the years the cover has been mistakenly credited to several artists, including Lou Feck and James Bama, both influential covers artists in their own right. 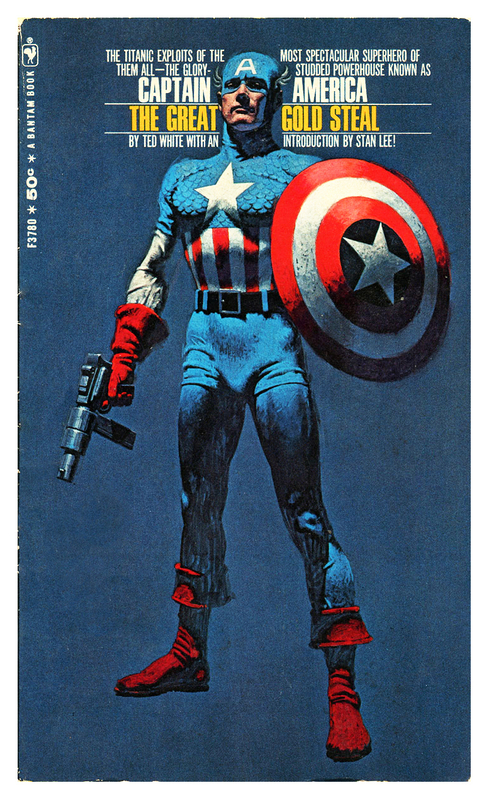 However, the cover was actually painted by Mitchell Hooks, who did a bang-up job. I also really like the design and use of bold type – Cap is so large and dominating even the novel’s title has to make way for him! Finally, I need to correct a common misconception that surrounds White’s novel. 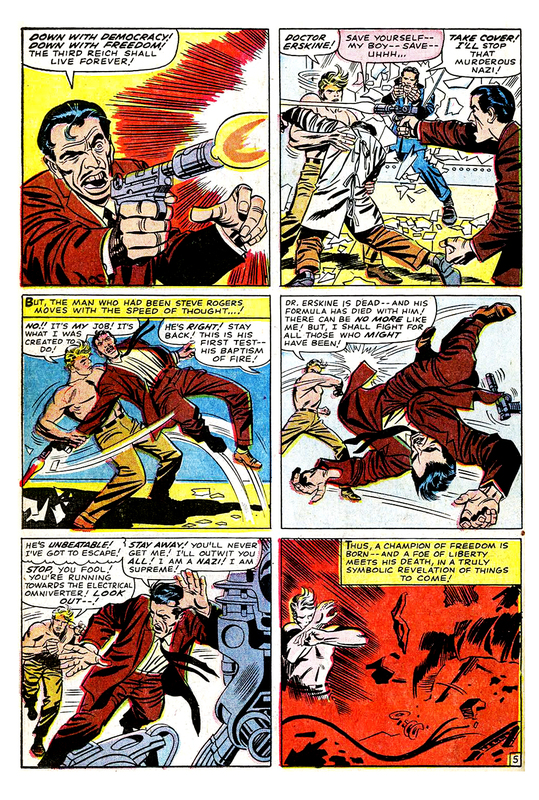 Although White is credited with creating some elements that made their way into the comics – for example his description of The Avengers mansion struck a cord with writer Roy Thomas who included the concept in The Avengers King-Size Special from 1967 – he is also falsely credited with changing the name of the scientist who created the Super Serum. According to the Kirby/Simon origin the character was called Dr. Reinstein while White renamed him Dr. Abraham Erskine. It’s believed by some comic fans that White’s name-change was retconned into the comic (the character also appeared in the film Captain America: The First Avenger) but in truth the name Erskine was used over three years earlier in Tales of Suspense issue #63 (March 1965). I’m not quite sure why White is credited with making a change which occurred long before he first put pen to paper. As I stated in my post on The Avengers Battle The Earth-Wrecker comics have their own story-telling language, one unique to themselves, and although Captain America: The Great Gold Steal is an entertaining read it ultimately fails as a concept. It may be a noble failure, but it’s a failure none the less. Adapting a visual medium into a prose one was a battle not even the mighty Captain America could win.